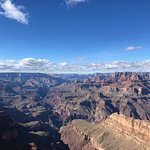 Tick off Arizona’s must-see destinations with ease on a tour of the Grand Canyon, the Sonoran Desert, Sedona, Oak Creek Canyon, and Flagstaff. An ideal choice for travelers with limited time, this excursion lets you cover more ground without painstaking prior planning. Plus, with hassle-free transportation, you’ll be able to take in the views at each location while sticking to a schedule that allows you to see them all. Your tour begins with pick up in the morning at your Phoenix hotel. Board an air-conditioned coach equipped with large viewing windows. Then, begin your journey to the Grand Canyon, driving through the Sonoran Desert, and into the red rock country of Sedona. Make a stop in Sedona and spend some time in town before driving a scenic route through Oak Creek Canyon. Cruise into the San Francisco Mountains and along historic Route 66 before arriving at the Grand Canyon. 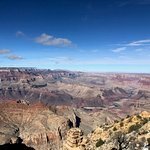 Stop for lunch (own expense) at a restaurant near the South Rim and get your first glimpse of the Grand Canyon. Explore at your own pace before rejoining your guide. 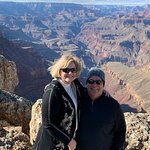 Next, enjoy a driving tour along the Grand Canyon to the East Rim, making stops for photos along the way. At the end of the tour depart the Grand Canyon through the Navajo Nation for a stop at the Cameron Trading post. Learn about the Navajo people and spend time shopping before the drive back to Phoenix. Pass through the Painted Desert, Little Colorado River Gorge, Flagstaff, and Verde River Valley before arriving back in Phoenix at your hotel. Day trip to the Grand Canyon! Get quick answers from Grand Canyon via Sedona and Navajo Reservation staff and past visitors.